I can’t believe Tony Curtis is gone! I found out early early this morning when my father woke me up at 5:30 AM to tell me, the first thing I said was “You woke me up at 5:30 to tell me this?” haha needless to say it took me a while to really realize what was going on and when I finally was awake enough to realize one of my most favorite actors of all time had passed away my heart broke. I read Mr. Curtis’s blog all the time constantly checking it for new posts, I felt like I knew him. I feel like I have lost a grandfather. 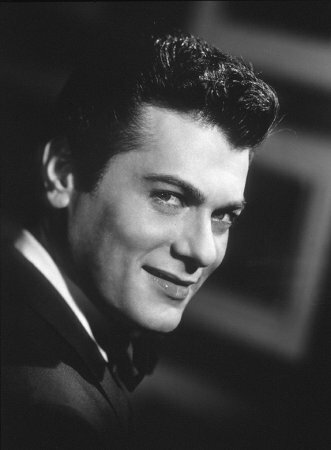 Tony Curtis was hilarious, he was an amazing actor..he’s in my favorite movie “Some Like it Hot” (I consider that movie to be a Jack Lemmon film but that is the movie that introduced him to me). The movie that really made him one of my favorite actors is “Houdini” I know a lot of people didn’t like that movie but I loved it! and Tony said he would have done it for free because of all the magic tricks he got to learn while making the movie. I always wanted to meet Tony, but I never got the chance every time he was doing a signing or having a screening of one of his movies I was busy, I just always thought he would be around forever. He was a great actor, artist and person, I am going to miss him like crazy.